ULTIMATE ITPL is also in to Android App Development. 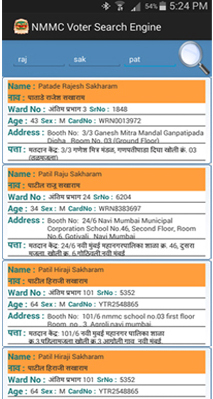 Voter Search Engine app is developed for Navi Mumbai Municipal Corporation General Election 2015. Media, political parties and voters will appreciate this initiative which will definitely help in discharging constitutional responsibility and mandate of conducting elections in efficient, fare and free manner. It will give search results like Voter Details Local Body wise, Ward wise, Booth wise.